Project: Wedding Invitation, Save the Date PDF, Wedding Invitation CD Packaging & Labels, Wine Labels, Swing Tags and Thank You Postcards. Brief: To design a wedding invitation within a CD format. A CD containing the wedding music will be given as part of the invitation. A New Zealand beach theme using Paua was requested. Solution: The format for the invitation has four folding panels and a perforated RSVP panel. 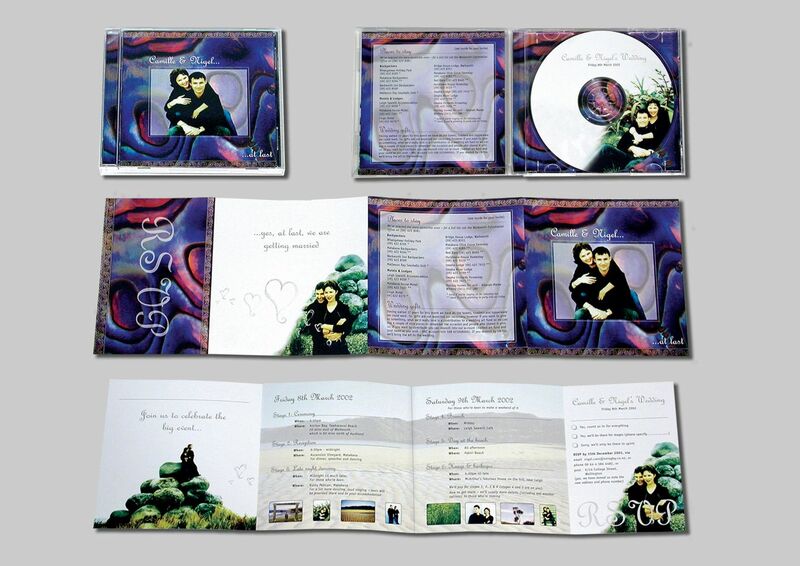 The back of the CD contains a list of the couple’s special songs. The Paua pattern is used on the outside of the invite and beautiful beach scenes on the inside, together they create overall New Zealand feel. “We are both so very happy with the wonderful wedding stationery you designed for us Thank you so much for doing such an outstanding job. The combination of the New Zealand beach and paua images was exactly the look we were after”.